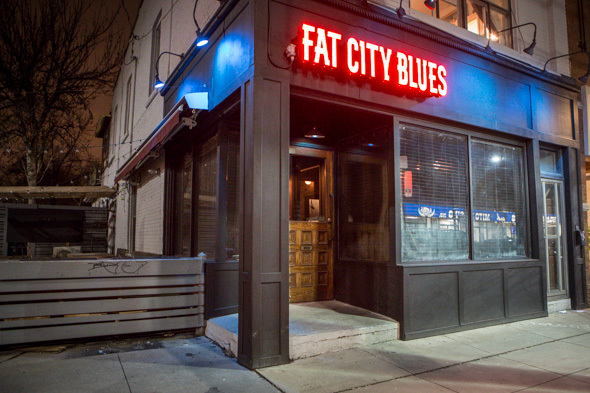 Fat City Blues officially opened on Thursday, bringing a New Orleans-style bar and a new music venue for jazz and blues to the city. Occupying the space at the northeast corner of College St. and Delaware Ave. that was previously Huntsman Tavern (and Red Fish and then Mitzi's before that), the "cursed" spot's high-turnover days may finally come to an end by invoking some good, ole-fashioned Louisiana-style voodoo (or, more realistically, a winning concept for the area). 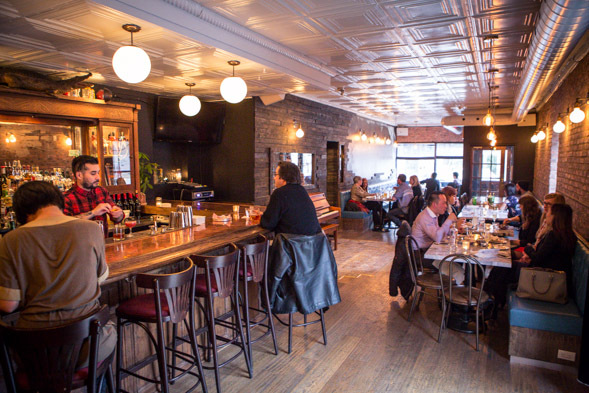 Owners Cameron Hutton, Steve McKeon (both of Small Town Food Co. ) and Simon Ho (a longtime mixologist at The Drake Hotel ) originally wanted to open in time for Mardi Gras last month, but renovations - surprise, surprise - took longer than expected. That's understandable, since the three friends decided to do everything on their own (with some woodwork help from Bread&Butter Designs and a back mural by Jeff Blackburn - you may have seen his work on traffic signal boxes around the city ). 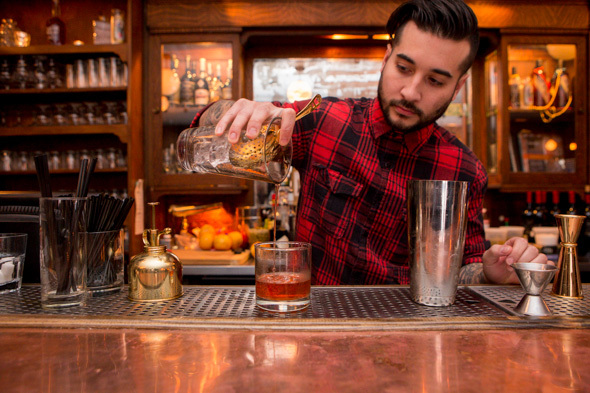 They designed the space and sourced everything themselves, down to the copper sheet they installed as their bar top. Mardi Gras beads, shrunken heads hanging in a display case and an inanimate alligator atop the bar shelf invoke the spirit of NOLA, as does the dapper, monocled alligator in a suit on the menus. The guys tell me this amusing character is their mascot (he definitely needs a name). A piano sits against a wall in the middle of the long room, which is where the musicians play after 9:30pm. Not having a stage makes the experience more interactive; during the soft opening, musicians stood on stools as they played while the audience gathered around. 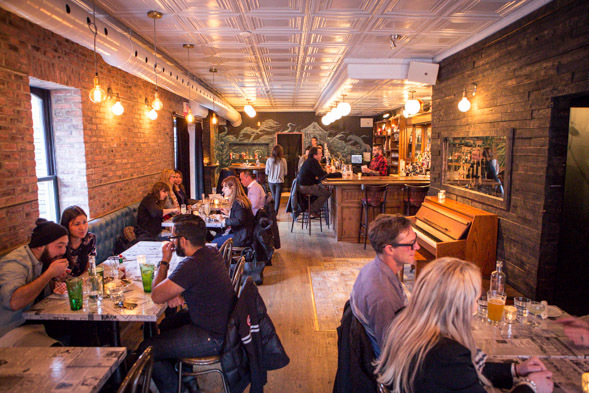 Focusing on blues and New Orleans-style jazz, the bar will host live music every Thursday, Friday and Saturday with the goal of expanding to six nights a week (they're closed on Mondays). Ho, who grew up playing jazz trumpet and has spent a significant amount of time in The Big Easy (he clearly loves it there), notes there aren't very many new jazz venues in the city, and they're hoping to inject some new life into the scene with this place. As for drinks, there are five classic Crescent City cocktails on the menu, like the Sazerac ($14), plus an equal number of Fat City Blues's own signatures, like the Fiyo on the Bayou ($12) - named after Ho's fave Neville Brothers album. 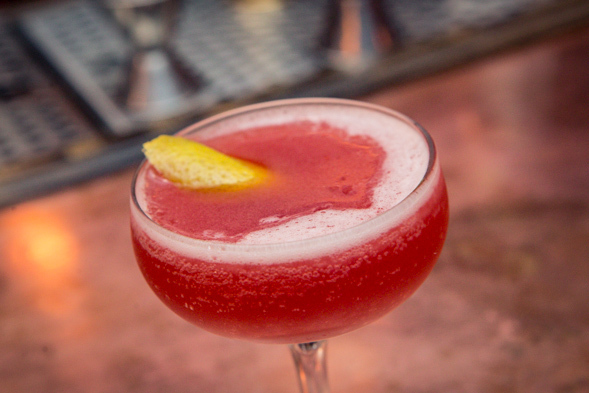 The Fiyo is a shaken-and-strained mix of gin, sloe gin, lemon and Chambord (it tastes like a Jolly Rancher). Six beers on tap (Blanche de Chambly, Steam Whistle, etc.) go for $6.75 each while short cans and premium tallboys go for $5.75 and $7, respectively. There are also plans to have "Fat Tuesday" drink specials. 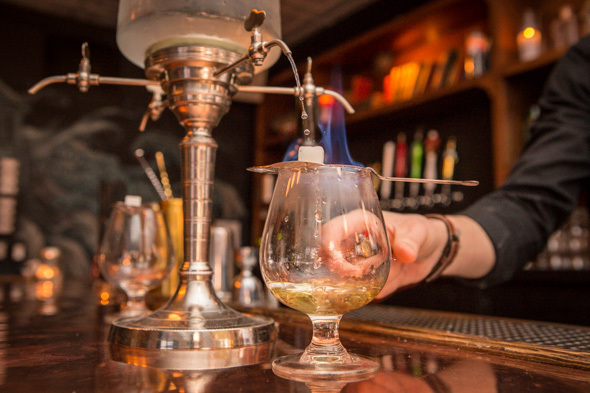 To feel like you're really in the French Quarter, get the absinthe. They currently have three kinds to choose from ( Dillon's , Pernod Superieure and Vieux Pontarlier) with intentions to expand their selection over time. We try the newly released, locally made, small-batch Dillon's ($13), and it's excellent. It's also fun to watch the process, as a sugar cube is placed on a slotted spoon and ice-cold water drips from the absinthe fountain until the sugar dissolves into the liquor in the glass, turning it into a milky greenish-white (called louche ). Although setting the sugar on fire isn't how it's traditionally done, it's still fun to watch. The guys want this to be a place where people can come in to eat and then stay for drinks and live music. Chef Charles Duncan aims to make classic, authentic New Orleans-style grub that's available until 1am. They also want to entertain: Cajun crab legs ($15) are served with a lobster bib, which diners have gamely been putting on. 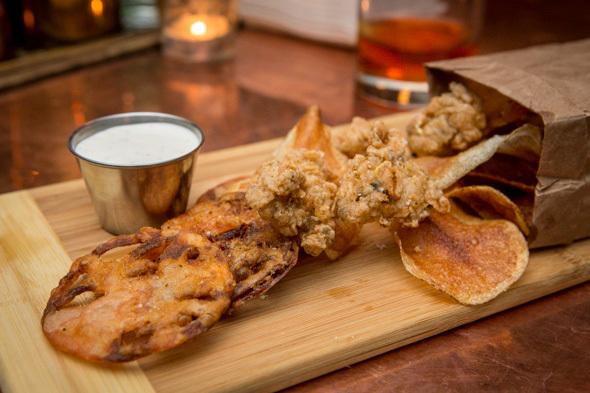 Fried oysters ($10) are presented in a small brown paper bag on a board, and come with thin, addictive slices of deep-fried tomato, Russet crisps (aka chips) and a lime-and-black-pepper dip that tastes like a citrusy sour cream. This is the perfect food for drinking. 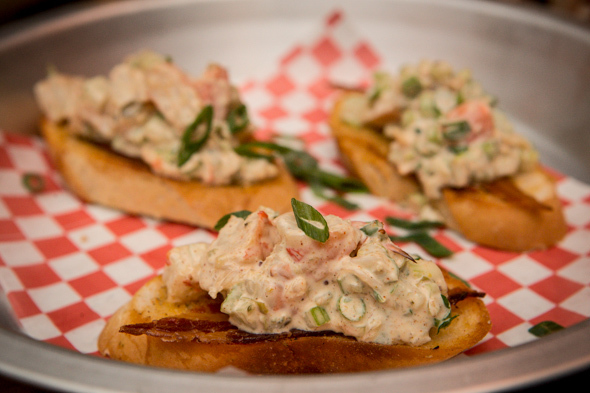 Shrimp Roosevelt ($10), three slices of toasted baguette topped with a layer of bacon and chopped tiger shrimp mixed with house-made "fat spice," makes for a tasty snack. Of course, there have to be po'boys on the menu, and they have six different kinds here, ranging from $10 (veggie) to $16 (alligator), with most priced at $12 (oyster, shrimp, catfish; beef is $11). 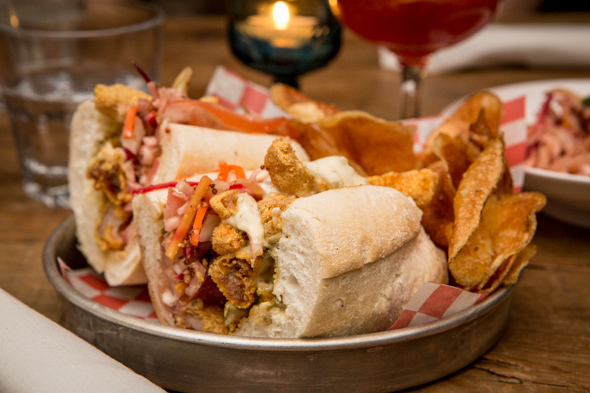 We try the Louisiana Alligator ($16) with a Cajun batter, slaw, tomato and remoulade. It comes with a pickle and Russet crisps, while sides of rice & beans, mustard greens, carrot salad or fresh salad can be added for $3. While the sandwich is flavourful, gator meat doesn't really have a very strong or distinctive flavour (in fact, some people - me included - think it tastes like chicken), and since it's covered in batter, sauce and toppings here, ordering it really is more for the novelty factor than actually tasting it. Hutton and McKeon (who've known each other since they were five) and Ho (who met Hutton 10 years ago when they worked at The Drake) seem genuinely invested in and enthusiastic about what they're doing. They're full of future plans for the place, including Louisiana-style seafood boils in the summer when the sweet side patio is open. Hopefully their friendship will help them survive the bad luck this space has endured in the past. "We were all good friends before this opened and we'll stay good friends," says Ho. "Debatable," jokes McKeon.